¡Proyectos Especiales! 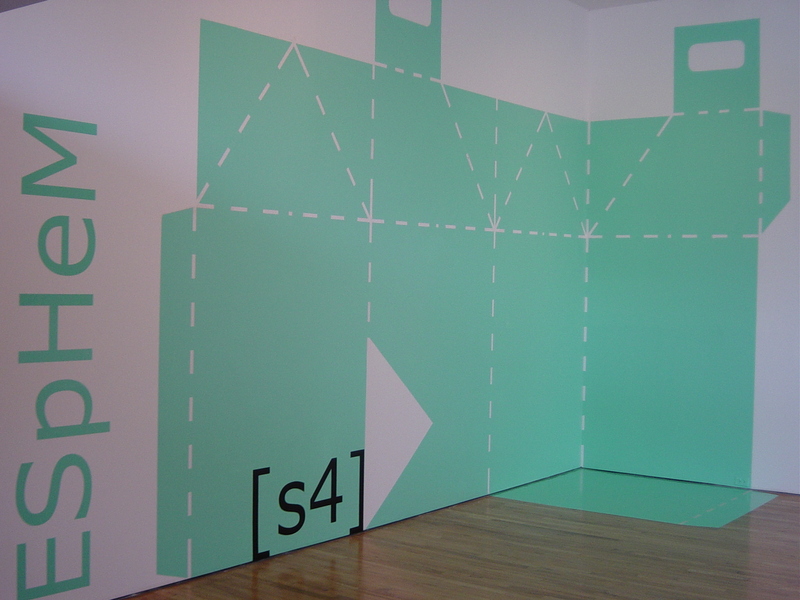 features the work of five Spanish artists based in New York. In conjunction with Salvador Dalí: Dream of Venus, ¡Proyectos Especiales! presents video, sculpture, installation, and mural as part of the Queens Museum of Art’s ongoing series of projects by emerging artists. Javier Viver and Ferran Martín pick up on Dali’s humorous cue with an oversized milk-carton and funhouse headgear, while Ester Partegás’s sterile landscape suggests the downside of living in “surreal” present times. An ethereal wall work by Gema Alava-Crisostomo and an MTV-age video work by Julio Soto deal with nostalgia and history in equally divergent ways. ¡Proyectos Especiales! is organized by Hitomi Iwasaki, Associate Curator. Julio Soto’s The Possibility of Utopia (2003) is an eighteen-minute work that takes audiences on a journey through conceptual and realized examples of visionary architecture from the twentieth century in an historical account of utopian planning around the world. In Soto’s documentary-like exploration of Akademgorok, a New Atlantis built by Russian scientists in the 1950s, Soto, a master of special effects, compiles found photographs with computer generated animation to create a narrative tension that ends in an abstract train ride through the rubble and slums of their failed military and urban accomplishments. Soto also invokes Archigram’s “Walking City”- a mix of science fiction and pop culture represented by a mobile pod of urban elements, splicing documentary footage with cutting edge computer imagery, mirroring the British experiment. The Possibility of Utopia will be screened in the museum’s new first floor video room. Javier Viver’s ongoing series of sculptural works ESpHeM (Empresa de Servicios para Habitar este Mundo/A Service Company to Inhabit This World) (2001-) explore architectural structures that address mankind’s temporal condition. He plays with prototypes of unlikely models of living in forms that are sometimes recognizable elements from daily life. His new work at the Queens Museum of Art is a familiar symbol of nourishment, and even safety. A giant milk carton installed in the café becomes a sanctuary for snacking. The provisional habitat is designed for easy assemblage and can be quickly dismantled, reflecting society’s fragile and transient nature. Ferran Martín’s video work created for the museum’s elevator refers to Dalí’s oeuvre, specifically seeking resonance with Dalí’s sculptural work Continuum of Four Buttocks (1952). In Le modulor II: continuum de quatros nalgas (2003), Martín wears a cubical headpiece plated in angled facets of mirror that reflects and perverts the images of the surroundings as he moves around. The image is created inside the elevator and recorded in video. The 48 second-long footage (the elevator’s actual traveling time) will be shown outside the elevator on monitors while inside the elevator is filled with audio effects composed of sound and music that evoke Dalí’s fascination with buttocks. The bare branches of four modular trees punctuating Ester Partegás’ sweeping mural in the Unisphere gallery provide no shade for the surreal architectural environment in which they seem to hover. Combining cartoon-like images of nature with stylized renderings of escalators and airport interiors, Partegás’ urban vista appears as a pathetic critique of increasing homogenization of contemporary public spaces. Manipulating scale and materials, she creates an aesthetic out of the ubiquity of ATMs and small furniture that keenly mirrors the seemingly innocuous ugliness of our global reality.